Ammonium dichromate has been used in the manufacturing process of fireworks, safety matches, oxygen candles, explosive bolts, components of a vehicles airbag and mining explosives. The toxic chemical, ammonium dichromate is also widely used as a mordant for dyeing pigments. Also used as a source of pure nitrogen in laboratories. The toxic chemical is used in the classic erupting volcano demonstration. The hazardous chemical is unstable and is incompatible with combustible materials, organic materials, acids, alkalis, and slightly reactive to moisture. The storage of flammable materials including ammonium dichromate needs not to be overlooked, and necessary precautions must be met. The chemical appears as solid, flaky, orange substance. The hazardous chemical is moderately flammable and may be combustible at high temperatures. The toxic chemical may ignite by friction with carbide. If ammonium dichromate comes in contact with substances that are readily oxidized, it can react rapidly enough to cause ignition. Incompatible materials must be stored separately. When storing ammonium dichromate, containers housing the chemical must be tightly closed. 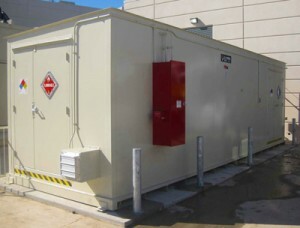 The chemical storage building that the containers are stored in must be well-ventilated and kept in a cool atmosphere. Segregate the chemical containers from acids, alkalies, reducing agents and combustibles. Do not store the hazardous material above 24°C (75.2°F). A proper temperature control system must be installed into the chemical storage building in order to remain fully compliant. Personal protection when handling shall include, splash goggles, protective lab coat, approved dust respirator and proper handling gloves. Acute health effects include skin burns and ulcerations if prolonged exposure occurs. In case of contact with eyes, immediately flush eyes with plenty of cold water for at least 20 minutes. Severe over-exposure can result in death. Potential chronic health effects of the substance may be toxic to blood, kidneys or the liver. Be sure to wear proper chemical safety equipment before handling ammonium dichromate. The storage of flammable chemicals, especially ammonium dichromate must be properly stored in order to remain fully compliant. When approaching the storage of flammable chemicals, precautionary measures must be met. Make sure that ammonium dichromate is stored in a dry, well-ventilated flammable storage unit for full compliance. When storage of flammable materials seems to be piling up – be sure to store incompatible materials separate. If incompatible materials are stored in the same storage room, combustion or a hazardous fire may occur. Be sure to segregate acids, alkalies, reducing agents and combustibles in the storage of flammable materials when using a fire-rated flammable storage building. Depending on the distance of where you are storing your flammables, be sure to choose from a 2-hour fire rated chemical storage building or a 4-hour fire rated chemical storage building. Keep your chemical storage safe and compliant with a fire-rated chemical storage building from US Chemical Storage.